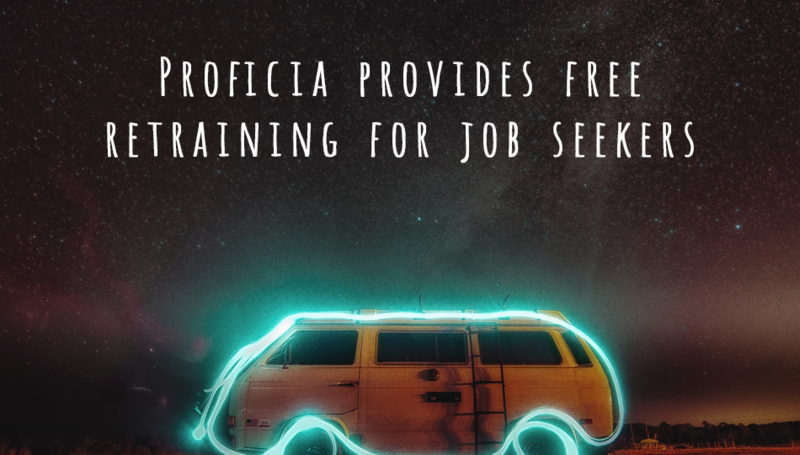 Job seekers who visit the CalJOBS website can now find Proficia listed as a training provider. Proficia offers three 10- to 12-week pre-apprenticeship programs in technical fields: web development, data analytics, and computer-aided drafting. The goal of each program is to prepare trainees to go into an apprenticeship or work-based training. A pre-apprenticeship is more similar to traditional schooling, in that it involves study and hands-on practice with real projects, but there is no wage for the trainee. An apprenticeship is a paid employment placement that includes being matched with a mentor at the workplace and ongoing professional development training. The idea of a pre-apprenticeship is to bring trainees up to the skill level necessary for an employer to agree to host apprenticeships for them. Many people who file for unemployment are not aware that they have access to WIOA funds, so it is worth inquiring and mentioning your interest in Proficia’s programs. Some centers run out of funds earlier than others, offer funding to different groups, such as veterans, or choose to fund only certain programs. Please contact Proficia’s team to get tips on how to proceed if your local center cannot fund you. In California, only training programs on a list called the Employment Training Panel List (ETPL) are cleared to educate job seekers using Workforce Innovation and Opportunity Act (WIOA) funds. Proficia was listed on the ETPL in 2017 and is one of the only training providers listed who offers cutting-edge technical training with a focus on middle- and high-skills careers. Training with Proficia includes an initial consultation on career strategy. Job seekers who are considering studying with Proficia can meet one of our team members who are familiar with the job market for their profession of interest. We will talk through the strengths and weaknesses of your resume and job experience in order to help you come up with a plan to maximize your potential for securing an apprenticeship placement after your training. As you embark on a training program with us, we create a short list of potential apprenticeship placement locations and begin to reach out on your behalf or coach you through the process of applying, depending on how formal the hiring process is. We provide tips on revising your resume, writing cover letters, navigating the job application process, interviews, and salary negotiations. If you realize through your studies that you want to adjust your direction, we can help you with your pivot. For example, some trainees start on a technical track but realize that they want to focus on maximizing their communication and leadership skills. Any of our pre-apprenticeships can lead into a project management apprenticeship that will combine technical and organizational talent. Our main location for these training programs is the LaKretz Innovation Campus in the Arts District of downtown LA. The Los Angeles Cleantech Incubator (LACI) at LaKretz is incubating about 40-50 portfolio companies at any time, many of which are co-located with us. This means that during your class breaks and lunch, you can sit in the break room side by side with the founders and employees of these startups. We have strong relationships with the portfolio companies and frequently receive requests to refer our trainees to them for potential internships or jobs. The LaKretz Campus also contains the Advanced Prototyping Center (APC), which comprises a machine shop, welding lab, electronics lab, wet lab, sewing lab, and computer lab. In addition to the portfolio companies of LACI, many other makers and inventors have memberships at the APC, where they are prototyping products. Some have years of experience in their fields and serve as mentors to our trainees as they work alongside Proficia in the labs. An APC membership, which includes access to 3D printers and laser cutters and a range of industry-standard software, can be included in our training programs when appropriate for a trainee’s career goals and experience. The LaKretz Campus is owned by the Los Angeles Department of Water and Power (LADWP), and its research engineers are based at the facility. Many non-profits whose missions include a sustainability component are based at LaKretz as well and welcome involvement from our trainees. The campus contains an amphitheater and other conference spaces that regularly host events for business and community organizations around themes of sustainability in transportation, energy, and smart cities. We also welcome job seekers with an entrepreneurial bent. Jocelyn Graf, Principal of Proficia, advises tech startup founders through the Bixel Exchange Small Business Development Center (SBDC) at the LA Chamber of Commerce, and she can provide similar advising to trainees who wish to go after independent consulting work or start a business. She is also on the Diversity in Entrepreneurship Advisory Council for LACI, which focuses on increasing access to startup support for people underrepresented in clean technology businesses. We don’t forget about our trainees after they leave our training programs. We have a range of non-profit partnerships and grant-funded programs that include regular “Demo Days” with our employer partners. Former trainees become part of our community, and they are welcome to stay in touch with us for job search support or ongoing technical mentoring. In addition to career coaching, Proficia curates a list of industry experts who provide one-on-one or small-group feedback to trainees on their projects, both intensively as part of the training curriculum, and on an ongoing basis from time to time. We look forward to hearing from job seekers interested in training with real applications in the job market today.